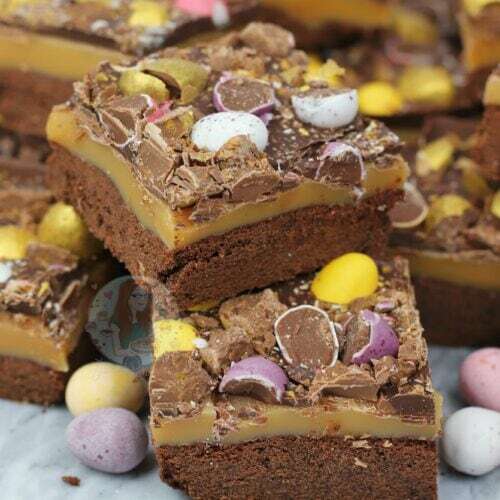 Buttery Chocolate Shortbread, Homemade Caramel, Milk Chocolate, and Easter Treats make the most delicious Easter Chocolate Millionaires Shortbread! So as its Easter season, I thought I would treat you to something I was craving and wanting for so long. A CHOCOLATE Millionaires Shortbread. This doesn’t just mean the Chocolate on top, this means the Shortbread is chocolate flavoured as well! Oh hellloooooo! 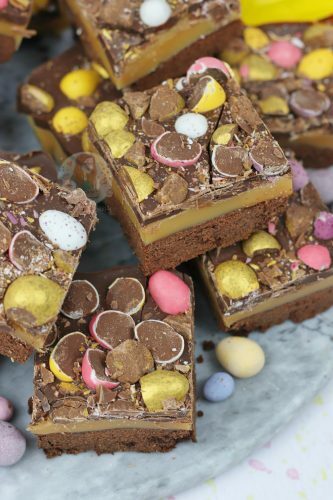 Honestly, I knew I wanted to do an Easter themed Millionaires Shortbread as you all love my Salted Caramel Millionaires Shortbread and my other shortbreads so much! 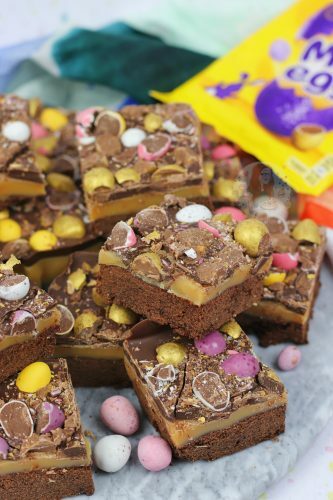 I didn’t just want to do something and add some Easter treats on however as it would have been too similar to my other recipes, so I thought I would make it next level, and add even more Chocolate. Chocolate Shortbread was the only way to go and oh my days it was DELICIOUS. I wanted to stick to my usual caramel, but took the salt out as I wanted this one to be quite sweet! I went for Milk Chocolate to top this one as its all I actually had, but Dark or White would work perfectly well as well! Depends on your mood and flavour choices! 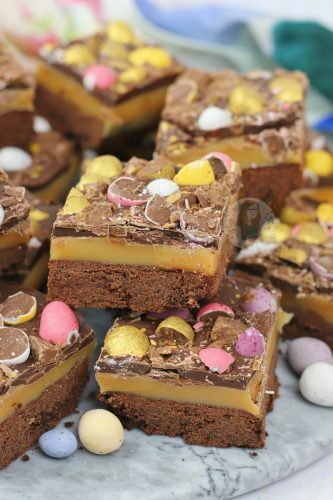 My Mini Egg Cookie Bars, Easter Brownies and Easter Rocky Road have always been popular since I posted them, even if they were only recent. I knew however that some of you still would want another traybake, so this delicious treat was born. 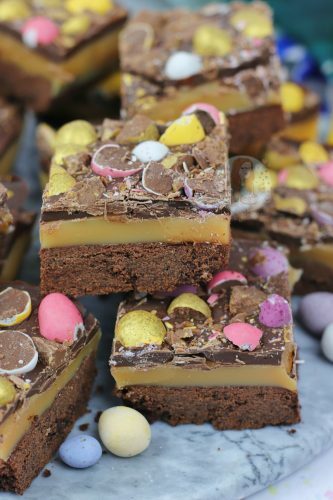 Buttery Chocolate Shortbread, Homemade Caramel, Milk Chocolate, and Micro Mini Eggs make the most delicious Easter Chocolate Millionaires Shortbread! Cream together the sugar and butter in a stand mixer with the paddle attachment until smooth – mix in the flour and cocoa powder until a dough is formed. Firmly press the mixture into the bottom of tin and bake in the oven for 25 minutes until dry looking on top! Once baked, remove from the oven and leave to the side. In a large saucepan pour the condensed milk, butter, sugar, and golden syrup and melt on a medium heat till the sugar has dissolved – stir frequently to stop anything from catching. Once the sugar has dissolved, turn the heat up high and let the mixture come to boiling point and boil for 5-7 minutes stiring constantly so that the mixture doesn’t catch. BE CAREFUL as the mixture is VERY hot and can burn you if it splashes back! The mixture will be ready when it has changed to a slightly darker golden colour, and has thickened to a soft fudge texture! Pour the caramel onto the shortbread base and leave to set either in the fridge to be quicker, or on the side to be softer. 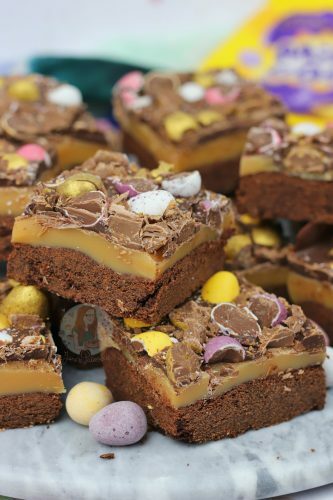 Once chilled/set, melt the chocolate and pour over the caramel – Sprinkle on some chopped up Easter decoration such as Mini Eggs. Chill the Shortbread back in the fridge for another 1-2 hours until the Chocolate has gone hard**! Chop your Shortbread into the separate pieces and enjoy! You can of course just use regular shortbread on the bottom rather than Chocolate flavoured – remove the cocoa powder and add 25g more plain flour! 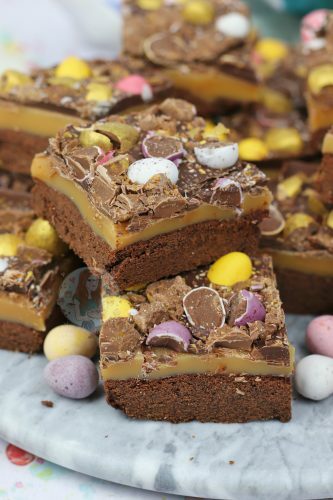 Find my other Traybake & Easter Recipes on my Recipes Page! Newer Previous post: No-Bake Galaxy Golden Egg Cheesecake! 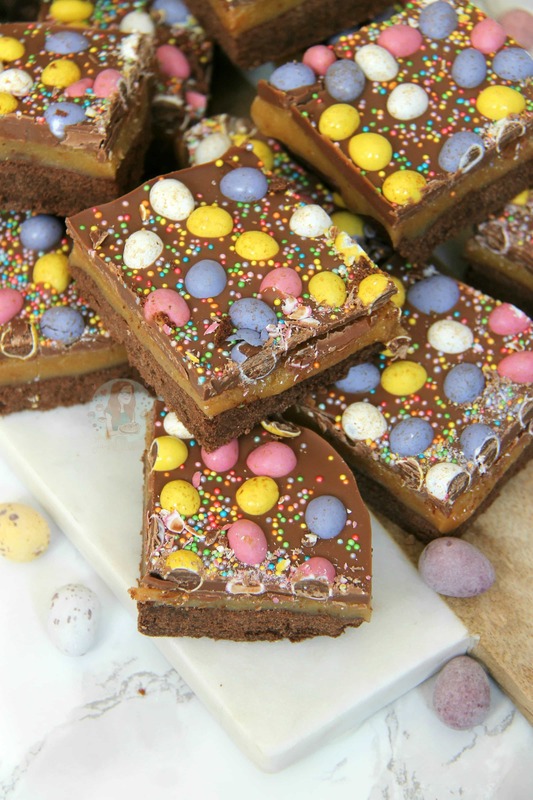 Thanks for this recipe, it was the highlight of my Easter! Such a good twist on a traditional millionaire’s shortbread. Hi Jane did you use a sugar thermometer when making the caramel? Or just go by colour and texture? For this sort of caramel you don’t use a thermometer – I don’t in any of my millionaires recipes. Is this for the shortbread? You can but it might be a little softer is all ?